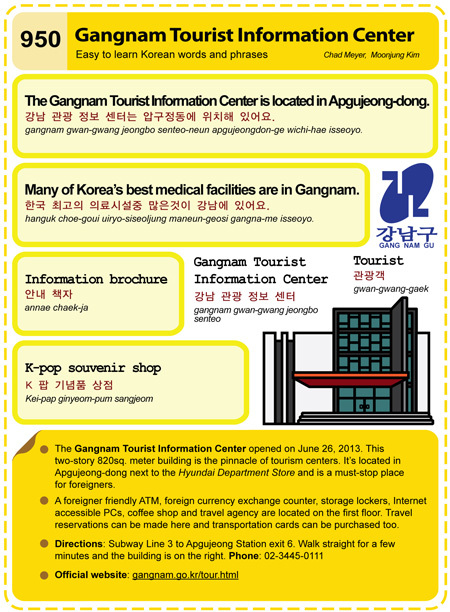 This entry was posted in Series and tagged Apgujeong-dong, Gangnam Information Center, Gangnam Trolley Bus, gangnam.go.kr/tour.html, Hyundai Department Store, information brochure, K 팝 기념품 상점, K-pop souvenir shop, medical facilities, tourist, travel agency, travel reservation, website, 강남 관광 정보 센터, 강남 관광 정보 센터는 압구정동에 위치해 있어요., 관광객 관광객, 안내 책자, 한국 최고의 의료시설중 많은것이 강남에 있어요. by easykorean. Bookmark the permalink.